The 1950s was the era of the 90 percent top marginal tax rate, and by the end of that decade live gate receipts for top championship fights were supplemented by the proceeds from closed circuit telecasts to movie theaters. A second fight in one tax year would yield very little additional income, hardly worth the risk of losing the title. And so, the three fights between Floyd Patterson and Ingemar Johansson stretched over three years (1959-1961); the two between Patterson and Sonny Liston over two years (1962-1963), as was also true for the two bouts between Liston and Cassius Clay (Muhammad Ali) (1964-1965). Then, the Tax Reform Act of 1964 cut the top marginal tax rate to 70 percent effective in 1965. The result: two heavyweight title fights in 1965, and five in 1966. You can look it up. In 1965, the top tax rate fell to 70%, and it stayed there until Reagan swaggered into the joint and knocked everyone on their asses. By the end of his second term, as he gave a parting high five to the incoming Bush, he’d gutted the upper bracket to a millionaire-friendly 28% on all earnings over $160,000 – in today’s dollars! Trickle down, baby! Do you know a wealthy someone who’s afflicted by a habitual carping about their income taxes? 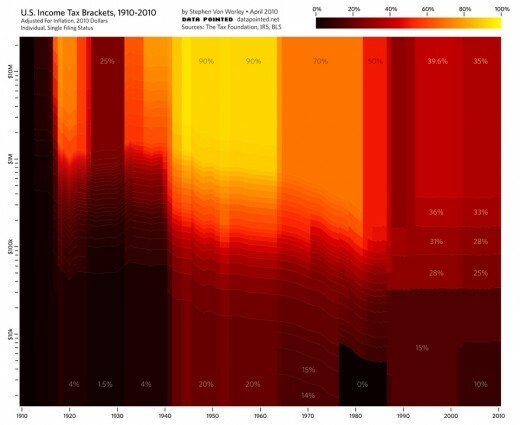 Get him or her near a computer, pull up this graph, point them towards the brilliant yellow-orange brackets that run from the Great Depression ’til the Reagan-Bush tag team, and they shall be healed!